Providing scalability this industrial grade USB to 8-Port Terminal Block serial adapter supports serial port data transfer rates of up to 921.6 Kb/s, Full Speed (12Mbits/Second) and USB 2.0 High Speed (480Mbits/Second) and is backward compatible USB versions 1.0/1.1. Support 8 RS232 Terminal Block Connections via USB 2.0. Designed for PC, Workstation, Thin Client, or Server for RS232/422/485 signals. Screw-Lock secure connection for USB Type-B Port. Supports one Downstream USB 2.0 Port for Daisy-chain Expansion Modules. 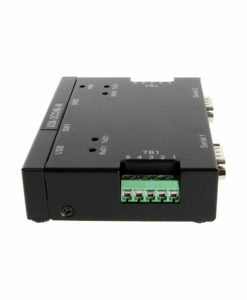 SA-8PXTB Industrial Rugged 8-port Terminal Block RS-232 USB 2.0 to Serial Converter is an Industrial Grade USB serial adapter designed to quickly add 8 high-speed RS-232 serial ports to desktop or notebook computers. The SA-8PXTB is compatible with new and legacy RS232/422/485 devices enabling your network to grow without sacrifice. This industrial grade USB to serial adapter supports serial port data transfer rates of up to 921.6 Kb/s, Full Speed (12Mbits/Second) and USB 2.0 High Speed (480Mbits/Second) and is backward compatible USB versions 1.0/1.1. Providing scalability, the USB 2.0 to Serial Converter can quickly adapt to new USB technologies, it also allows for multiple modules that can be added to a single USB interface for RS232/422/485 connectivity as needed. The SA-8PXTB 8-port RS232/422/485 to USB 2.0 Module Box is designed for your PC, workstation, thin client, or server to provide instant RS232/422/485 Serial port expansion via the Universal Serial Bus (USB) and supports applications needing combinations of RS232, RS422 and RS485 in one single USB port. It supports screw lock features for the upstream (USB type B) port connector from the Host to prevent accidental disconnection. Using the Plug-and-Play features and drivers, simply follow the instructions of Install Wizard until the install is complete. The terminal blocks enable you easily install your wires for different devices and their direct connections. The SA-8PXTB is an ideal solution for your expanding applications and making a big success in your projects. USB 2.0 High Speed (480Mbits/Second) and Full Speed (12Mbits/Second) compatible, backward compatible with USB 1.0 and USB 1.1, the USB 2.0 type “B” connector equips a Screw Lock Mechanism. The 8-Port Terminal Block RS232/422/485 to USB Adapter has certain accessories that work with it. These accessories are what you can order if needed. Did you misplace or break a part that came with your 8-Port Terminal Block RS232/422/485 to USB Adapter? Purchase it here!